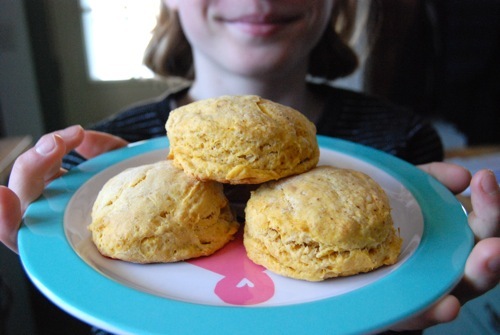 Bet you didn’t know there’s such a thing as a “biscuit loving gene,” but it’s true! My daughters and I have inherited the BLG (many thanks to my southern momma) and are always on the lookout for our favorite flaky bread. Unfortunately, traditional biscuits are often way too high in sodium for me. Solution? 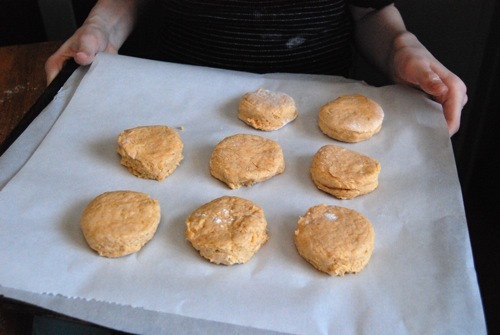 Worry free biscuits with a sweet potato twist. 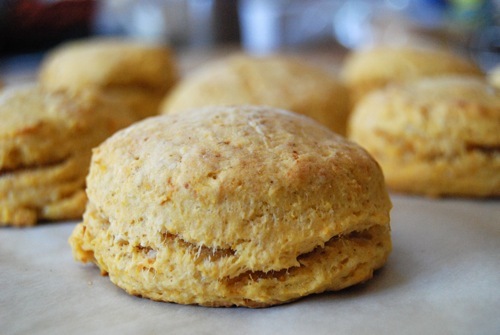 Baking biscuits from scratch may seem hard, but don’t be fooled. 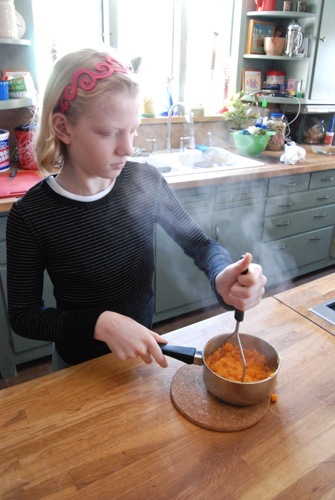 As part of this week’s Cooking with Kids! my older daughter made these herself, start to finish and she’s only 10! OKAY, okay – Almost 11! (sheesh) My older daughter loves food, mostly eating it. 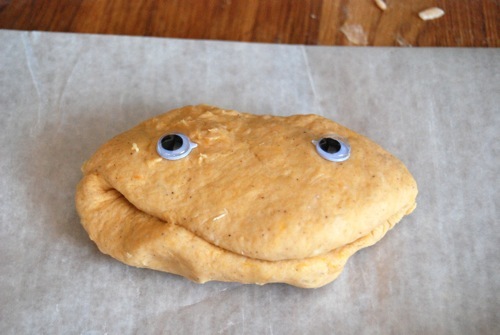 But she sure had fun getting her hands dirty and even had a creative use for the leftover dough. As someone who’d previously made little for herself besides a bowl of cereal, it’s safe to say this recipe is pretty foolproof. And if my (nearly) 11 yr old can do it, so can you! Adapted from Food Network Kitchens Favorite Recipes. Preheat oven to 425 degrees. Get out a baking sheet, line with 2 sheets of parchment and set aside. 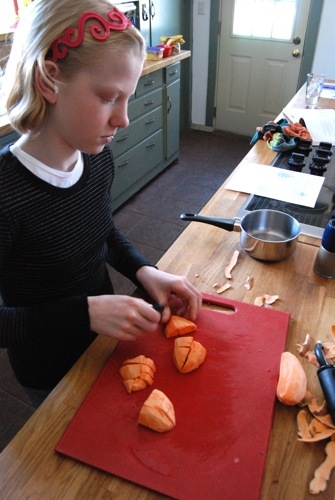 Peel the sweet potato and cut into small chunks. Place chunks into a small saucepan, add enough water to cover, then bring to a boil over high heat. 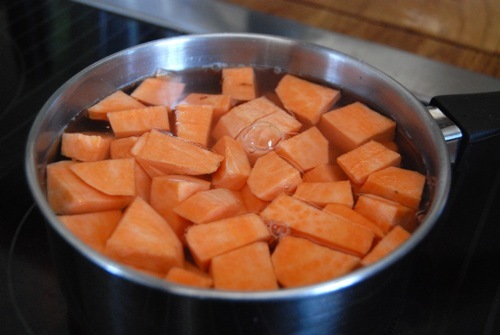 Once boiling rapidly, lower heat and boil until sweet potato is soft, roughly 15 minutes. Remove pan from heat, drain, then mash the sweet potato well. Measure out 3/4 c. and set aside. 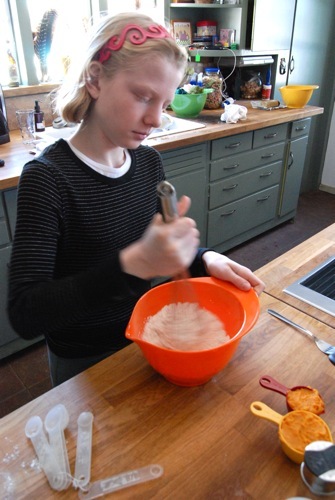 Measure the flour, baking powder, brown sugar, cinnamon and allspice into a mixing bowl and whisk together. 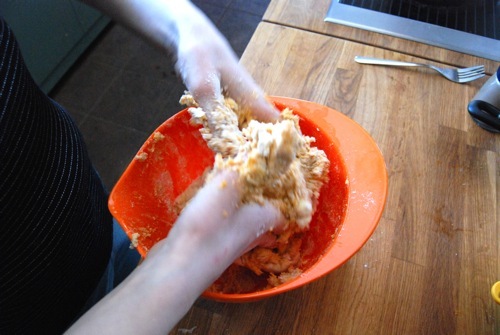 Add the butter and cut into the dry mixture using your (freshly washed) fingertips. 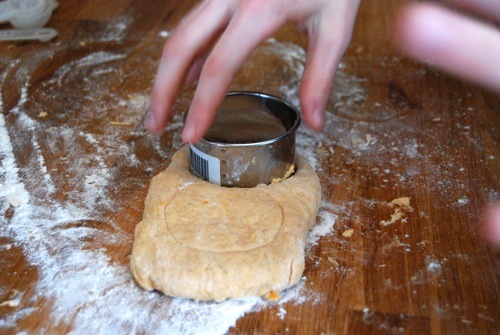 Process the dough until the butter is broken down to roughly pea sized pieces. 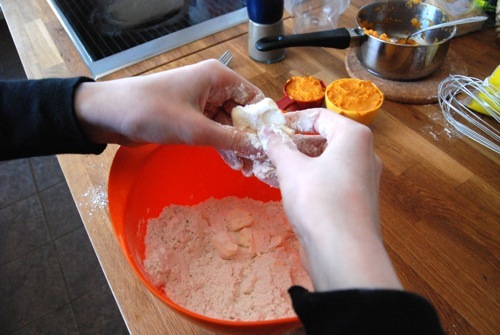 Add the mashed sweet potato and milk and mix to form a moist dough. 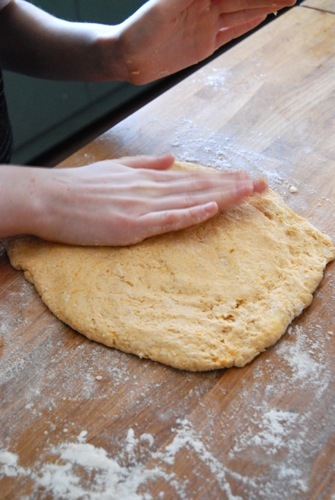 Turn out on a lightly floured surface and pat dough into a rectangle about 1/2-inch thick. Fold dough into thirds, as if folding a business letter, then pat lightly into a (roughly) 8 x 5-inch rectangle, about 3/4-inch thick. 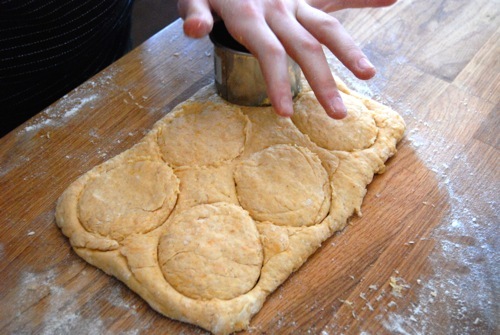 Using a 2-3 inch round biscuit cutter, cut out 6 biscuits, then gently transfer to baking sheet. 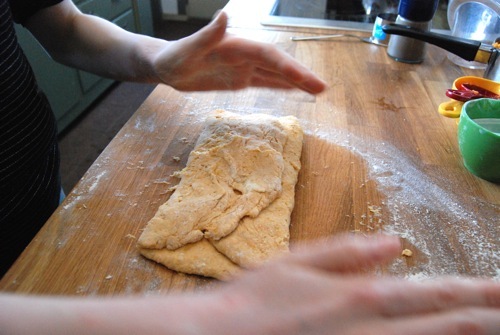 Pat the dough scraps together to form another small rectangle, cut out 2 more biscuits. 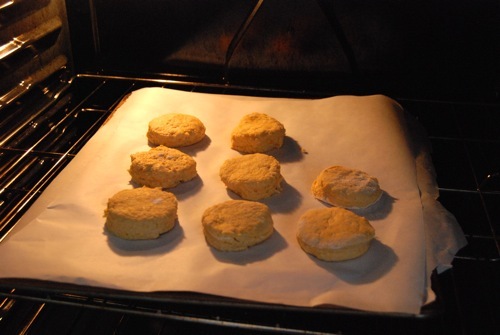 Transfer biscuits to the baking sheet. Place baking sheet on middle rack in oven and bake 12 minutes, until lightly browned. Remove from oven and place on a wire rack to cool. Cool briefly before serving. Is there any way you can list the calorie counts with the recipes? Hi Diane – great question! Right now I can’t, but I’ve applied for a grant which would allow me to upgrade the site and include (among other things) complete nutritional information for each recipe. I will be posting about this grant on Tuesday. Public voting for the grant contest begins then (March 1st) and I will need all of your support via VOTES. Please, if you value The Daily Dish, consider casting your vote of support for the betterment of this site! Thanks so much! Hi Cindy! Wonderful! When making these with Maya, use the same amount of regular baking powder (whatever kind you get from the grocery store will be fine). But if you bake any other recipes from the site calling for sodium free baking soda, use only HALF the amount of “standard” arm & hammer type baking soda. For instance recipe says 1 t. Ener-G sodium free baking soda, use 1/2 t. regular baking soda. Important to note or your cookies (or whatever) will taste – and probably look – baaad! I can’t wait to try it. I will have to make it Gluten Free. Maddie and I are the biscuit lovers in the house. She loves to cook also. I can’t believe how grown up Madison is. She is beautiful! Biiiiiiiiiscuits. The best part about going to Bob Evans every time I visit my family in Ohio. I don’t think I have the gene, because I used to always order rolls over biscuits, but it was certainly an acquired taste for me. Katie, not sure I’ve ever been to Bob Evans (there’s never been one near me) but John & the girls all LOVE sausage. I imagine that restaurant would be quite the hit! Maddie’s favorite biscuits at present come from KFC. In the rare event we pick up some chicken she hoards the biscuits and then pesters everyone for theirs. I’m not supposed to eat them, but I’ve been known to indulge..
Hey! Yes, they don’t do biscuits better than down south. Mads is loving her new & easy hairstyle. She’s growing up so fast! I’ll tell her you like it; she’ll be thrilled. I made this with only 1 tsp of sugar and no other spices. We really enjoyed these! I will make again. Yay! Great to hear, Laurie!